What Path is the Real World Following? Our aim is to help people understand global climate change  and how the factors that drive climate are changing. We start with climate diagnostics  people are usually most interested in climate change itself. But cause-and-effect analysis requires also data on climate forcings (which drive climate change) and feedbacks (which amplify or diminish climate change). We update graphs of "Storms of My Grandchildren." Yet the greatest insight about processes discussed in "Storms" is often provided by other quantities, for example, the rate of ice sheet disintegration. We include some data from other scientists or their web sites, as indicated. Continual updating of data curves, whether global temperature, the Greenland ice sheet mass, the sun's brightness, Keeling's carbon dioxide record, or other more obscure quantities, is a most interesting aspect of science. Sometimes data curves follow an expected path, sometimes not, but we usually learn something. As Richard Feynman said, there is a pleasure of finding things out. That pleasure is now mixed with concern. Humans are altering the measured curves. But whether climate change will be moderate  something humans and most species can adjust to  or whether climate change accelerates and spins out of control, with devastating consequences for future generations  that depends. Future climate depends on how climate forcings change  human-made greenhouse gases, especially carbon dioxide, and forcings that are not yet well measured, especially aerosols. The speed and degree of climate change also will depend upon how fast amplifying feedbacks, such as Arctic sea ice, the large ice sheets, and methane hydrates come into play. Global Temperature (last modified 2019/04/15, "Global Temperature in 2018 and Beyond"
"Perceptions of climate change" PNAS 2012 109 (37) E2415-E2423. Author Summary and Full Text published ahead of print August 6, 2012. "Reply to Rhines and Huybers: Changes in the frequency of extreme summer heat" PNAS 2013 110 (7) E547-E548; published ahead of print February 5, 2013. "Reply to Stone et al. 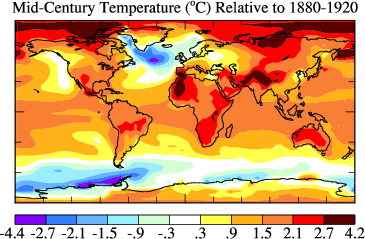 : Human-made role in local temperature extremes" PNAS 2013 110 (17) E1544; published ahead of print March 19, 2013. "It's Not Your Imagination. Summers Are Getting Hotter." by Nadja Popovich and Adam Pearce published in New York Times on 2017/07/28. Ice melt, sea level rise and superstorms: evidence from paleoclimate data, climate modeling, and modern observations that 2°C global warming could be dangerous Atmos. Chem. Phys., 16, 3761-3812, 2016, published on 2016/03/22. Regional Climate Change and National Responsibilities Environ. Res. Lett. 11 (2016) 034009 (9 pp. ), published on 2016/03/02. Video abstract is available from the paper site given above. Young People's Burden: Requirement of Negative CO2 Emissions " Earth Syst. Dynam. 8, 577-616, Discussion posted 2016/10/04 and Final paper published on 2017/07/18. Video Discussions: Video 1, Video 2, Video 3.